If Whistler’s best hotels earn a five-star rating, then Eric Porter, Carl Moriarty and Margus Riga’s preeclipse accommodations would qualify for a few billion. The trio enjoys a stunning view of the Milky Way high above the bustle of Crankworx. The plans to get there were loose. The specifics of “there” were even looser. The time, however, was not. At 9 a.m. on August 21, 2017, a total solar eclipse would arc across North America—the first time such a celestial event would be visible from the entire contiguous United States in nearly a century. And while the eclipse wouldn’t be “total” in Whistler, BC, it would still be rare. Myself, Carl Moriarty and photographer Margus Riga had gathered in Whistler for a different, though less rare, occurrence: the 2017 Crankworx festivities. We wanted to be somewhere special, preferably above tree line with a killer view. And seeing as we had just finished watching the slopestyle event and only had 15 hours to get there, it had to be close. That place, we decided, would be Lord of the Squirrels. Winding among the alpine lakes and meadows a few thousand feet above the Whistler valley, Lord of the Squirrels (LOTS) had officially opened just a few days before but was already on its way to Whistler-classic status. 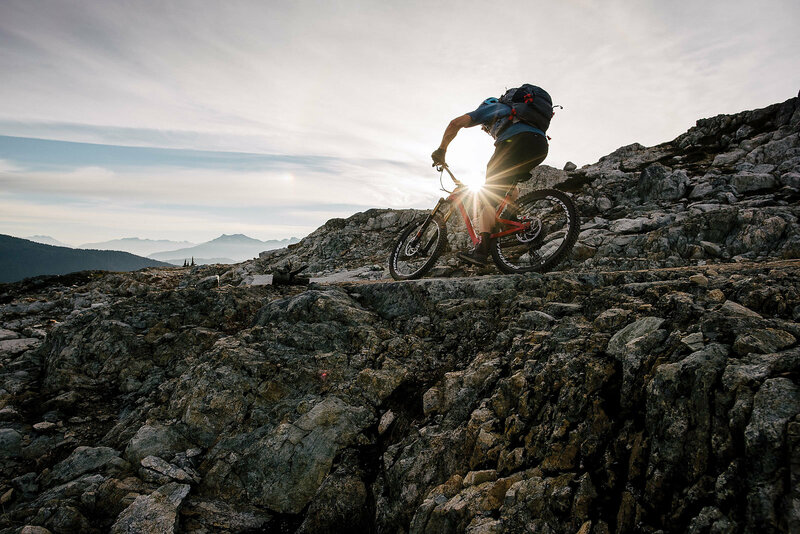 Depending on the route, reaching the top of LOTS—which the Whistler Off Road Cycling Association spent three summers and nearly 8,800 hours building—requires climbing almost 4,000 vertical feet along 7.5 miles of singletrack, without a chairlift in sight. For our group, that brutality was a huge draw. I enjoy such climbs and the hard work that goes into them, and that kind of epic effort would get us away from the bike park crowds and onto trails that weren’t as hammered. On LOTS, the climb is a big squirrel catcher, if you will—it’s a world-class descent, but only for those willing to earn it. Reaching the alpine above the Whistler Valley requires a brutal, 4,000-vertical-foot climb, and a complete Lord of the Squirrels lap can take anywhere from four to eight hours. But for those who survive the “squirrel trap,” the riding—and views—are some of the best in the area. Eric Porter, enjoying some of Whistler’s most scenic singletrack. We had only a few hours before nightfall, but figured it was enough to get into the alpine before dark. Then we’d have time in the morning to enjoy the views, ride some of the upper trails, and take in a celestial phenomenon. We grabbed our ultralight overnight kits, and after a quick stop for snacks and a few cans of double IPA, started pedaling. You can’t miss Into the Mystic; just look for the beautiful log-and-metal archway marking the entrance. The machine-built climbing trail begins in a thick, old-growth forest, rising at the perfect grade for a long slog with the occasional roll to catch your breath. Don’t get me wrong— it’s steep, but not old-school steep (though on a late-August day, it’s nice to be in the shade). The forest thins as the trail creeps upward, and after a few steeper pitches breaks through tree line into the vastness of Mount Sproatt. The sun was closing in on the horizon by the time we made it out of the trees and to On the Rocks, the connector to LOTS. Craggy peaks stretched in all directions, golden light spilling across the alpine lakes and meadows of wildflowers that stretched down the ridgeline. Despite the beckoning views, it was getting late and we still had to find our campsite. 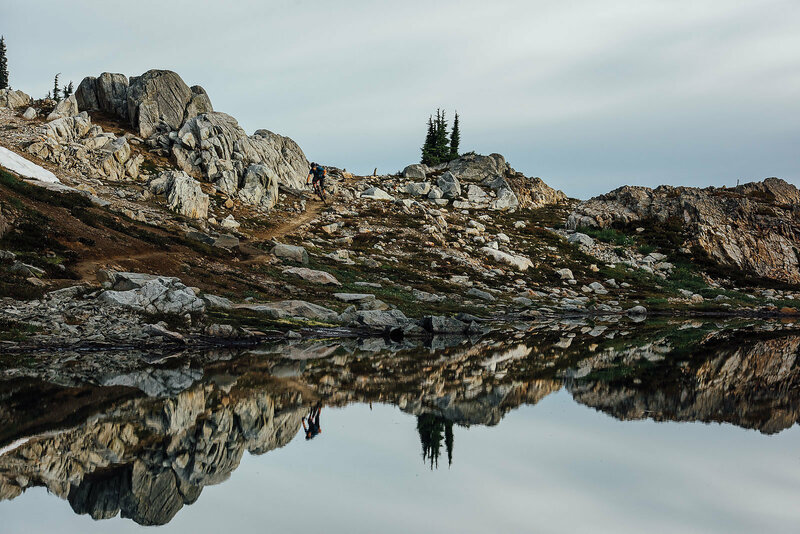 Snow lined the trail where it dipped onto north-facing sections, occasionally forcing us to walk our bikes as we searched for the perfect spot— somewhere with views of the Whistler valley, protection from the wind, yet near enough to the summit that we’d avoid climbing much in the morning. We eventually found something suitable, and as we set about cooking our dehydrated meals, Margus pulled a surprise from his pack: a precooked steak, which he graciously shared with us. Added to our Jetboil-cooked dinners, it made for the perfect camp-food equation: difficulty of activity, multiplied by epic-ness of location, equals deliciousness of food. Nailed it. Globally, solar eclipses aren’t that rare: on average, one is visible from somewhere on Earth approximately every 18 months. Common or not, they can still provide some invaluable experiences, especially when wedged between an alpine overnighter with friends and a 4,000-foot, world-class descent. Quiet settled over the August evening, bringing with it much-needed calm after the madness of Crankworx. It was the perfect time to crack a beer, sprawl on the heather, and watch the alpenglow fade slowly into black, billions of stars competing with the lights of Whistler far below. The next morning, we rose with the sun to make the most of our time before the eclipse. After doing some ridgeline exploring, we once again began scanning the sides of the trail— this time, we were looking for our perfect eclipse-watching spot. All the while, we marveled at the amount and quality of trails in the area, totally different from anything in the bike park. We eventually found ourselves on a spur trail called Happy Hour, an out-and-back leading to an overlook of the entire Whistler Valley. This was it, we decided, and settled in to eat lunch and watch our clocks. Suddenly, the temperature plunged, the sky turned a dusky, dark red, and an eerie silence surrounded us, as if someone had hit the pause button on nature. It was an amazing event, and I could imagine the terror early humans must have felt. But the most profound part wasn’t the astronomical phenomenon. It was being able to watch from that place, with those people, knowing we had one of Whistler’s most anticipated descents ahead of us. Slowly the sun came back, and we returned to the task at hand: charging down a mountain, in a truly special place.